Just because we’re The Trail doesn’t mean we’re good at staying on the beaten path. In fact, we stray more than a feral cat with five legs. We stray more than a Willie whisker. We stray more than a zealot in the devil’s fudge shoppe. We stray more than Tiger Woods in a jungle of … blondes? Anyways, we digress (see? told ya …). The point is, this week for Vinally Friday we’re really stepping outside the box. 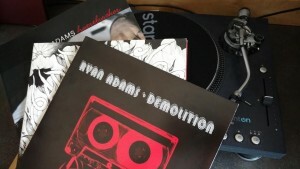 To honor one of our favorite artists – and to hype up his Saturday show at the Wilma – we’re rotating three different Ryan Adams albums on the ol’ turntable. Yep, for one day only it’s not Vinally Friday, it’s Ryanally Friday here on the Trail. Tune in to Tommy all afternoon to hear cuts from Heartbreaker, Demolition and Cardinology. Heartbreaker is the alt-country musician’s debut solo album from 2000; Demolition, his third solo effort, was released in 2002 and comprises tracks from previously unreleased studio albums; and 2008’s Cardinology is represents Adams’ fourth and final work with backing band, The Cardinals. Big thanks to Trailhead Mike for donating his vinyl (again) for the cause! Finally, it’s Friday! It’s Ryannally Friday on the Trail 103.3!